ASK any young Cambodian what they want to be when they grow up and it is highly unlikely a firefighter will make the list. MEANDERING through a large but silent crowd, Sok Somloan steps up from the busy street into the scorched threshold of her family’s burned out home and business in Siem Reap. “I was at home with my daughter,” explains the mother of three young children, pointing to an electrical panel where she says the fire began last Monday night around 6pm. “My husband was at work and I went to grab the fire extinguisher but it didn’t put the fire out,” she adds, her face expressionless as she stands in a shallow pit of dirty water, broken glass and melted plastic. Kneeling nearby, her mother scratches with blackened finger tips through the charred remnants of their DVD shop, trying to maintain her balance. Below her a layer of soggy noodles cover the floor, peeled from their packages during the fire and enlarged by the water that neighbours and firefighters used to put out the flames. Occasionally she uncovers a piece of jewellery and remnants of dollar bills – savings that the family had stored in a wooden desk for safekeeping, now reduced to burnt paper and ash. Unable to suppress the flames that night, Sok Somloan says she fled the three-story building and called the local fire department. “It felt like they took hours,” she says softly, adding that her neighbours helped to fight the fire for nearly an hour before fire trucks arrived. “I just grabbed a bucket and took water from the street,” explains a shopkeeper next door, citing rain that fell earlier in the afternoon. Although no one was injured in the fire, Sok Somloan and her husband are responsible to their landlord for repairs because the building is a rental property. She says the damages, estimated in the thousands, could have been minimised had firefighters arrived sooner. 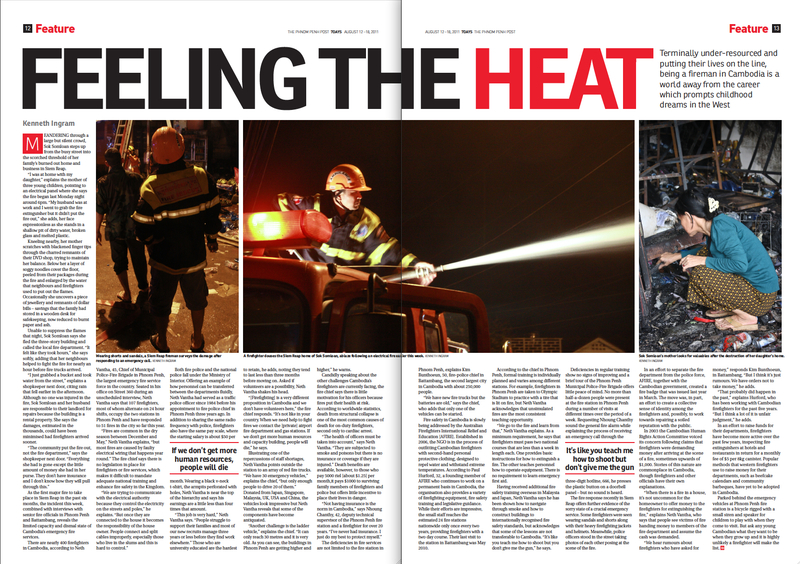 As the first major fire to take place in Siem Reap in the past six months, the incident this week, combined with interviews with senior fire officials in Phnom Penh and Battambang, reveals the limited capacity and dismal state of Cambodia’s emergency fire services. There are nearly 400 firefighters in Cambodia, according to Neth Vantha, 45, Chief of Municipal Police-Fire Brigade in Phnom Penh, the largest emergency fire service force in the country. 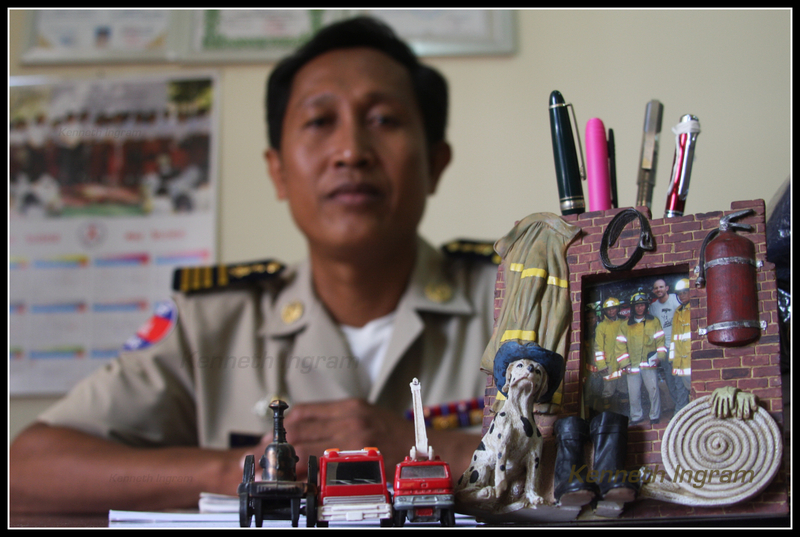 Seated in his office on Street 360 during an unscheduled interview, Neth Vantha says that 107 firefighters, most of whom alternate on 24 hour shifts, occupy the two stations in Phnom Penh and have responded to 51 fires in the city so far this year. “Fires are common in the dry season between December and May,” Neth Vantha explains, “but most fires are caused by faulty electrical wiring that happens year round.” The fire chief says there is no legislation in place for firefighters or fire services, which makes it difficult to mandate adequate national training and enhance fire safety in the Kingdom. Both fire police and the national police fall under the Ministry of Interior. Offering an example of how personnel can be transferred between the departments fluidly, Neth Vantha had served as a traffic police officer since 1984 before his appointment to fire police chief in Phnom Penh three years ago. In addition to sharing the same radio frequency with police, firefighters also have the same pay scale, where the starting salary is about $50 per month. Wearing a black v-neck t-shirt, the armpits perforated with holes, Neth Vantha is near the top of the hierarchy and says his earnings are a little less than four times that amount. “This job is very hard,” Neth Vantha says. “People struggle to support their families and most of our new recruits manage three years or less before they find work elsewhere.” Those who are university educated are the hardest to retain, he adds, noting they tend to last less than three months before moving on. Asked if volunteers are a possibility, Neth Vantha shakes his head. “[Firefighting] is a very different proposition in Cambodia and we don’t have volunteers here,” the fire chief responds. “It’s not like in your country. When we need help to fight fires we contact the [private] airport fire department and gas stations. If we don’t get more human resources and capacity building, people will die,” he says. Illustrating one of the repercussions of staff shortages, Neth Vantha points outside the station to an array of red fire trucks. “We have 30 emergency vehicles,” explains the chief, “but only enough people to drive 20 of them.” Donated from Japan, Singapore, Malaysia, UK, USA and China, the vehicles look impressive but Neth Vantha reveals that some of the components have become antiquated. “Another challenge is the ladder vehicle,” explains the chief. “It can only reach 30 metres and it is very old. As you can see, the buildings in Phnom Penh are getting higher and higher,” he warns. Candidly speaking about the other challenges Cambodia’s firefighters are currently facing, the fire chief says there is little motivation for his officers because fires put their health at risk. According to worldwide statistics, death from structural collapse is one of the most common causes of death for on-duty firefighters, second only to cardiac arrest. “The health of officers must be taken into account,” says Neth Vantha. “They are subjected to smoke and poisons but there is no insurance or coverage if they are injured.” Death benefits are available, however, to those who pay 5000 riel [about $1.25] per month,it pays $1000 to surviving family members of firefighters and police but offers little incentive to place their lives in danger. The deficiencies in fire services are not limited to the fire station in Phnom Penh, explains Kim Bunthoeun, 50, fire-police chief in Battambang, the second largest city in Cambodia with about 250,000 people. Office of Kim Bunthoeun, Fire-Police Chief in Battambang, the second largest city (by population) in Cambodia. His desk is adorned with momentos from Australian firefighters who have supported his department through the provision of used firefighting equipment. “We have new fire trucks but the batteries are old,” says the chief, who adds that only one of the vehicles can be started. Fire safety in Cambodia is slowly being addressed by the Australian Firefighters International Relief and Education [AFIRE]. 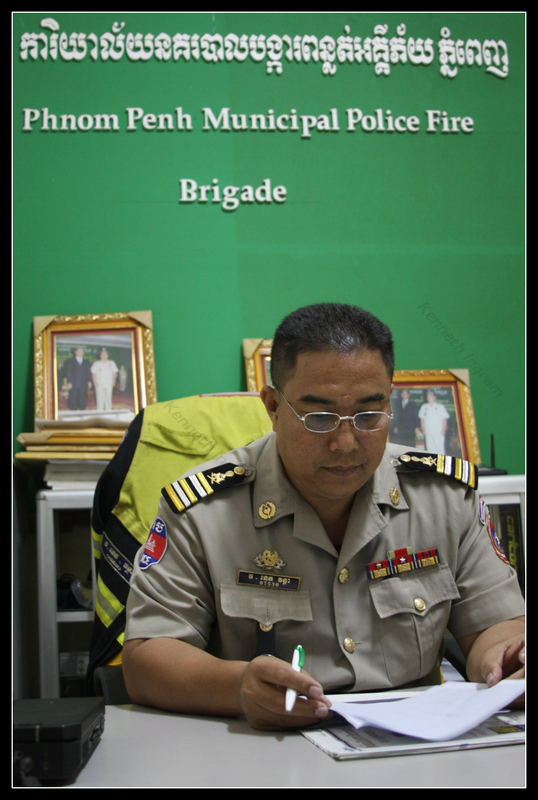 Established in 2006, the NGO is in the process of outfitting Cambodian firefighters with second-hand personal protective clothing, designed to repel water and withstand extreme temperatures. According to Paul Hurford, 32, a founding member of AFIRE who continues to work on a permanent basis in Cambodia, the organisation also provides a variety of firefighting equipment, fire safety training and legislative guidance. While their efforts are impressive, the small staff reaches the estimated 24 fire stations nationwide only once every two years, providing firefighters with a two day course. Their last visit to the station in Battambang was May 2010. According to the chief in Phnom Penh, formal training is individually planned and varies among different stations. For example, firefighters in Phnom Penh are taken to Olympic Stadium to practice with a tire that is lit on fire, but Neth Vantha acknowledges that unsimulated fires are the most consistent teaching opportunity. “We go to the fire and learn from that,” Neth Vantha explains. As a minimum requirement, he says that firefighters must pass two national courses that are less than a week in length each. One provides basic instructions for how to extinguish a fire. The other teaches personnel how to operate equipment. There is no requirement to learn emergency first aid. Having received additional fire safety training overseas in Malaysia and Japan, Neth Vantha says he has been shown how to navigate through smoke and how to construct buildings to internationally recognised fire safety standards, but acknowledges that some of the lessons are not transferable to Cambodia. “It’s like you teach me how to shoot but you don’t give me the gun,” he says. The fire response recently in Siem Reap offers further evidence of the sorry state of a crucial emergency service. Some firefighters were seen wearing sandals and shorts along with their heavy firefighting jackets and helmets. Meanwhile, police officers stood in the street taking photos of each other posing at the scene of the fire. In an effort to separate the fire department from the police force, AFIRE, together with the Cambodian government, created a fire badge that was issued last year in March. The move was, in part, an effort to create a collective sense of identity among the firefighters and, possibly, to work towards repairing a soiled reputation with the public. In 2003 the Cambodian Human Rights Action Committee voiced its concern following claims that firefighters were demanding money after arriving at the scene of a fire, sometimes upwards of $1,000. Stories of this nature are commonplace in Cambodia, though firefighters and other officials have their own explanations. “When there is a fire in a house, it’s not uncommon for the homeowner to offer money to the firefighters for extinguishing the fire,” explains Neth Vantha, who says that people see victims of fire handing money to members of the fire department and assume the cash was demanded. 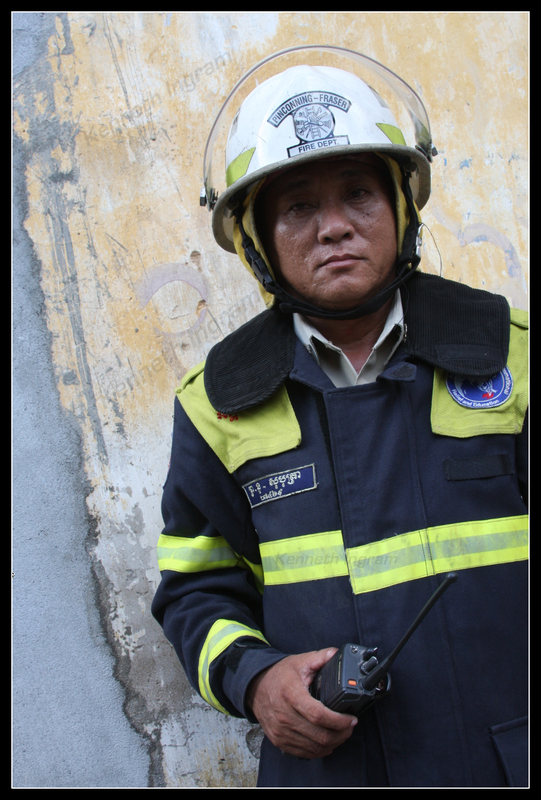 “We hear rumours about firefighters who have asked for money,” responds Kim Bunthoeun, in Battambang, “But I think it’s just rumours. We have orders not to take money,” he adds. “That probably did happen in the past,” explains Hurford, who has been working with Cambodian firefighters for the past five years. “But I think a lot of it is unfair judgment,” he adds. In an effort to raise funds for their departments, firefighters have become more active over the past few years, inspecting fire extinguishers at hotels and restaurants in return for a monthly fee of $5 per 8kg canister. Popular methods that western firefighters use to raise money for their departments, such as beefcake calendars and community barbeques, have yet to be adopted in Cambodia. Parked behind the emergency vehicles at Phnom Penh fire station is a bicycle rigged with a small siren and speaker for children to play with when they come to visit. But ask any young Cambodian what they want to be when they grow up and it is highly unlikely a firefighter will make the list.